One last week of advice, an offer and NEWS! First and foremost, to all of you I want to say Happy Holidays, Merry Christmas and my wishes for a happy, healthy and prosperous 2019 for you and your family! And, I can speak for all of us here at DLF when I say that, each of you make up our extended family! We wouldn’t have it any other way and it’s what keeps us going. I know the lineup advice will be far less this week and to that I say: Thanks to the football gods! While it’s a labor of love it’s also a tremendous amount of work and a very large burden as I know many of you take my advice directly and change your plays based on what I say. The hardest part about this weekly piece is treating EVERY question as if it was the only one I received all week. When time with family is already too short as is, there’s a constant balance between making sure everyone gets served as I promise each week – including my family. I don’t believe there is any fantasy footballer out there who goes deeper than I do with each lineup decision and I do stamp each one with my own due-diligence sometimes using as many as 12+ different data points from trending metrics to something as simple, but just as critical, as the weather. All of these points are variables in a much larger equation that result in an answer. I wish for all of your sakes, I could be right on every call. I wish some of them didn’t cost you games that could be the difference between a championship trophy or missing the playoffs altogether. It happens and I do feel each wrong suggestion. But the fact is, if I was afraid of the failure, I would retire this series. But who would that serve? This year, the lineup advice was largely open to all, Premium member or not. For next year, soon in fact (I’ll get to that), we will offer this service only to our Premium members. Those are the individuals who support DLF monetarily and they deserve to have it to themselves. 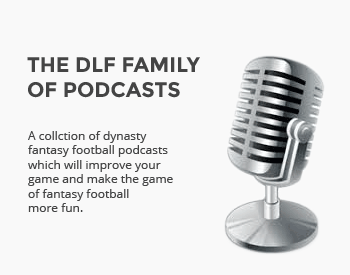 If this series has been impactful to you and you’re not a Premium member, maybe you’ll consider joining the thousands of others who call DLF home? We can’t do what we do without coaches stepping up to support us in that way. You’d be surprised at how much it takes to keep the lights on at DLF while maintaining the high standards we do. If you are not a member, and would like to consider it this week before our prices rise on 1/1/2019, let me know with a comment below and I’ll offer you a promotional code. Supplies are limited and the code will expire with 2018. Most importantly, however, is the purpose of this article. And that purpose is what makes DLF so different than all other fantasy sites. Through this weekly offering, I get to interface with each of you on a personal level. No, it’s not the same as sitting down and sharing a coffee or a beer, but we get to connect over this passion of ours and in that connection, I/we get to establish a relationship. What other site with thousands of members seeks to get to know each of their members individually through this interaction? It’s what drives us here at DLF and it’s a promise we offer each of you. As the last seconds of the old year tick away and the first seconds of the new year arrive, I will be extending the depth of this “Advice” series into the off-season to cover all other topics including trades, draft/rookie analysis, commissioner help, roster building, strategy, add/drop, etc. etc. There are no limits to what can be asked and I’ll be here all off-season helping our members to prepare for 2019 in whatever way YOU need me to. I may be crazy but we’re going to give it a shot. You deserve it. Many other fantasy services offer this type of advice with varying price tags but we’ll be offering this simply as another value-addition to our monthly or annual subscription cost. It’s that simple! Lastly, we’ve reached the final week of the regular season and this is your chance to say whatever you are thinking about either this season, your fantasy results, DLF or my advice given here in this series.. This is your time to share or rant, if you like, about my advice or the season at large. And what a strange season it was, especially during the playoffs. We love to know when we’ve made a difference for our members but we also are committed to listening to ALL comments, be they positive or negative. I’ve got broad shoulders but, at the same time, nothing pleases me more than when I hear we/I have made a difference in your fantasy experience. Call out to you DLF, what say you? Hey Jeff. thanks for all the advice this season. i squeaked into the playoffs, slid into the finals and won!…by 0.23 points!. In my set up all the league winners (27) set line ups with the top three scorers for the week cashing in BIG. without further ado Once More Unto the Breach Dear Friends! Wow … watch those stat corrections which should finalize today! Congrats! thanks for your advice this season, i´m looking forward to talk to you about trades and different offseason stuff in the next months. You all are doing a great job and i really appreciate the opportunity to always get another opinion on my fantasy football team. Thanks Manuel …. still love the fact that you follow us from Austria. I’ve got to get that world map started! Thanks again! Merry Christmas and happy new year to you. I discovered this Forum late in the year but definitely took advantage of it. I think this in and of itself is worth the if Premioum membership. There are always places to get free weekly rankings and projections but rarely can one have a conversation about those rankings and sit/start calls like on here. I am excited you will open it up this offseason to more types of advice. I will definitely take advantage of it. I started dynasty for the 1st time in 2017 doing a Salary Cap league having no idea what I was doing in both dynasty or just good old football. I got lucky and drafted some top young rookies that year but other than that my season was dismal and depressing. I managed to finish 7th in our 12 Team league (points scoring). This is the last week of our season and it looks like I will finish 4th with a decent chance at 3rd, which is headed in the right direction after cleaning up the mess I made last season. 2020 is the year I am among to win after my rebuild but I think with good offseason moves I have a shot at next year. I will use you more starting now. Thanks Jeff and enjoy some time off with the family during playoff season. It still amazes me that so many don’t know about DLF but we don’t do much external advertising and rely on word of mouth so I guess it makes some sense. But we’ve been here since 2006! We also stand by our rankings as being the most complete and accurate in the game. We’ve worked hard on them over the years. It’s all about learning the format and building over a long period of time Josh. Sometimes I love taking orphan teams and turning them around. More than anything, keep plugging away. Every year is a new year and you can always make changes to strategy. Dynasty takes a few years to figure out and even more importantly, learning the different coaches in your league … they all have different strategies and no two leagues are the same because of it. Thanks for supporting us here and let’s get to work! Just wrapped up my first Dynasty season. Unfortunately Bell and McKinnon were two of my first three picks so heading into next year with the first pick of the rookie draft. Or would be if I hadn’t traded that pick in the start-up draft (which landed me Tarik Cohen in return). Anyway, would love to leverage your resources during the off-season and into next season and try the site out. So far the content has seemed great. Any chance there are some promotional codes still left over? I love seeing so many new faces coming into dynasty. Once you go dynasty, you’ll never go back. You can use LASTCHANCE2018 to get a big discount to what our new price will be on 1/1 (or soon after if we run into issues). I’m a little nervous about my bandwidth for advice 365 days a year but we’re going to give it a go. Along with writing articles, Combine analysis, draft analysis, rankings and keeping the lights on over here, it’s a ton of work. But I love the interaction with our membership. Somehow never saw this reply and didn’t follow up until today due to travel over New Years. Any chance of extending the promotion? Understand if not possible but figured it didn’t hurt to ask! My playoffs are over and I am tentatively winning by .7 points! Praying for no stat corrections to see if I win my Dynasty League for two years in a row! Just wanted to say thanks again for what you do. I didn’t take your advice last week and started Michel (thank God!) but I still always appreciate the work that you do. And as silly as it is, you commenting that my decision was one of the hardest if the week was really cool. Today is the day stat corrections are usually in/finalized so I’ll keep my fingers crossed for you. Good job and starting Michel over Gronk. I NEVER thought Gronk would face plant like that. In fact, I should have started Michel instead of Gurley. Instead, I decided to risk Gurley starting knowing that I could fall back to Breida. Gurley didn’t start, Breida reinjured himself in the first quarter and I lost one championship because of it. It happens … but that is why I usually tell others to not risk injury unless it’s a “stud” like Julio Jones, etc. Even then, depends on the nature of the injury. Our members test me all the time with those questions and I always appreciate the really difficult ones. Truth be told, on some of them I’d just prefer to punt and pretend I didn’t see the question. LOL. Thanks for your support Ryan …. love seeing regulars week over week. Hey Rich … we do try to focus on the dynasty aspect over redraft but the lineup advice and even the waiver wire advice is often valuable for redraft as well. And with my extension of the “advice” article, I’m not going to limit the questions. That said, we don’t plan any solely redraft pieces because we want to focus on what we do better than anyone else in the world. As far as rankings go, we always watch to see how are rankings are compared to other sites and we don’t think it’s even close. That said, we also don’t believe in making daily changes to players since it’s dynasty. We ask for our rankers to update once a month if possible globally, but to stay on top of news/changes as players suffer injury, are traded etc. Our articles and rankings are meant to be used together to make for a more complete experience and valuable site. One without the other doesn’t tell a story. And rankings are incredibly difficult to keep up to date. Just too many players and it takes a ton of time. We’ve tried to find the balance between accuracy and timeliness. We always keep tweaking and we’ve had very few complaints the past couple of years where before it was a constant flow. You can use LASTCHANCE2018 for a $24.99 annual cost but that will be expiring soon. No pressure either way. Won my ship! Not every recommendation I got from you was perfect, but who could possibly expect that. Your advice gave me an extra bit of confidence and got me the places I needed to when I needed to. Wound up beating my championship opponent by 70, but it was nice to have some piece of mind going in. Thanks for all the help! Awesome Sam, congrats! And for some reason, your lineup gave me trouble this year …. not sure why that is. But you also had some players that came from nowhere certain games and then disappeared. Feast or famine players are VERY difficult to predict and in lineup advice, I usually prioritize safety-production over swinging for the fences. As such, you won’t see me taking Derrick Henry, Mike Williams, Tre’Quan Smith, etc. unless they perform more consistently. Nice to win by so much as well … makes the game really fun when you can just sit back and know you are going to win it all. Hi Jeff, Belated Merry Christmas and a prosperous 2019 to you. DLF is a great site. You can use LASTCHANCE2018 if you’d like to try us out for the year at the $24.99 price point. We’ve been doing what we do since 2006 and complaints are VERY rare. I think a lot of that is because we are SO hands on with our members and seek to get to know each of you individually. You just won’t find our level of service anywhere else. It’s who we are, not what we’re trying to be … is what I always say and there’s a big difference in that! would love to have you on board supporting us! Hey Jeff, I am going for the ring. Need RB advice from a sorrowful lot. We play three. Who to start from Ingram, Damien William’s, Jaylen Samuel’s, Josh Adams, Justin Jackson, S Ware & D Lewis ? Ingram, Williams and Adams. Even if Ware plays, Williams starts for me here. Thanks for everything this season! Solid advice and I have enjoyed our interaction. I have found a great amount of value in your advice to me. No better words you can tell me Troy and I sincerely thank you! We all do! It’s why DLF is here and the moment we aren’t living up to our members’ expectations or the value proposition we’ve built this site on, that’s the moment we’ll unplug. It’s that simple. Thanks for all of your lineup advice this year Jeff!! With a little Energon, and a lot of luck (both team names Transformer based), I was able to win the championship in both of my leagues this year…the rare double ‘ship! Really looking forward to this column expanding into the offseason. Thanks again! A clean sweep … doesn’t get better than that! I’m glad DLF was along for the ride. No go start preparing for the double threepeat ….. Thanks Harris … glad we could be along for the ride with you. I’ll be coming out with an article shortly about just that topic so stay tuned! Thanks for calling DLF home! 0.35 PPR Guy again here. I just wanted to say thanks for all your help this season. I fell a little short of the goal but ended with a pair of 2nd place finishes and a 4th place finish. Overall, the season was a success! Thanks again and I look forward to your assistance in 2019 and beyond! Thanks Tyler, much appreciated. Too bad you couldn’t lock down a ring but it was a VERY odd last couple of weeks and those finishes are nothing to sneeze at. Now let’s get to work on next season! Glad you call DLF home! Jeff, I cannot thank you enough for dedicating your time to this piece each week, I find it the most valuable offering from DLF and I have been a paying member since the first week it was announced. I have not missed a single article in many years. I play in 4 leagues now and made it to the playoffs in all of them and advanced to the semi’s in all the leagues also. I ended up with one championship, a 2nd place, a 3rd place and a 4th place finish. It was a banner year! Awesome Ryan! Congrats on the great finishes, especially given how odd those last three weeks were. I can’t thank you enough for supporting DLF for as long as you have. So awesome! We can’t do what we do without the support of our Premium members, it’s really quite that simple and there aren’t many who can say they’ve been around for as long as you have! Thomas, Burkhead and Cain in that order for me. Cain is intriguing but he carries the greatest risk of never becoming anything special. At least the other two are in for more snaps. I really think Thomas has a lot of upside. Collins sure flamed out but I think he can still be added. Bridgewater is going to get another chance to start, probably in ’19. Patterson is a gadget player than can be added in deeper leagues. Hollins, Meredith and Watson are just VERY deep roster additions though Watson may be the gem there. I’m moving on from Hogan … just not enough consistency. Crabtree can still be rostered but I’d move him for anything I could get and I likely wouldn’t pick him up if he’s out on your waiver wire now. Jeff,your assistance throughout the year was greatly appreciated and resulted in three championships and a second place finish (where I really did not have that good of a team.) out of 11 leagues. Barely missed the playoffs in three of the others. I am in the finals of yet one other this week and need your recommendations yet again. My question is pertaining to which of my RB’s to start. I get 1 pt. per 5 rushing yds. and 1 pt. per 20 passing yds. Can only start 2 (no flex) and am currently starting Gus Edwards (Cle.) and Chris Carson (Ari.). Also on my bench are Mixon (@ Pit.) , D. Cook (Chi. ), and S.Ware (Oak). What do you think on this Jeff? I like the match up for Edwards and Carson, not so much for Cook and Mixon. Ware coming back from injury to a possible time share with Williams. Would appreciate your thoughts Jeff. Hope your Christmas was very Merry and thanks again for all of your help this year. Very nice Kevin … that’s awesome. It was an odd playoffs and some really weird things happened all across the fantasy landscape. I like Carson and Mixon myself but can understand the Gus love … I just couldn’t start him myself. It’s going to be a big game for PIT and I think CIN is going to be playing inspired ball with Mixon getting a ton of work. The Edwards time share worries me but he’s getting touches but I still like Mixon a fair amount better. Cook is the spoiler but vs. CHI, that’s a tough matchup. If Ware is up, that makes Williams a tough play. PPR, and I need consistency over a big game. Would you play Herdon over Gronk? Would you sit Kamara and Brees this week? I could play McGuire If I need too as well as Foles. Boy at this point, I think you have to. Gronk burned a lot of people last week and something isn’t right. At least Herndon is producing now and I love his upside. The Saints’ situation is exactly why many don’t like week 17 championships. I don’t mind them as long as it is at least a two game championship starting in week 16. I don’t think you can play either of the Saints this week but take it up right to the last 15 minutes and see what is being said. Even still, I don’t see them getting much time with nothing to play for. McGuire at least will be motivated to make an impression as a possible starter in ’19. Jeff, no lineup advice this week, just came here to say thank you for the help and advice this season and thank you to DLF as a whole. It’s because of this site that I am able to say I won three championships last week — two leagues for the first time ever including one league that I’ve been competing in for 8 years now. Been using all the advice and suggestions you guys have offered in articles and on the forums to be able to slowly put together a team that I doubt I would have been able to on my own – advice on prospects and draft analysis that led me to landing Hopkins, OBJ and Michael Thomas with my 1st round picks in their draft years. Being able to use advice on trade negotiations to take some surplus WR depth to land Gurley last season while also getting a QB prospect as a throw in who had led to play a down yet named Patrick something, which then allowed me to put together a package including Aaron Rodgers this year to get Ertz. Also waiver wire suggestions to pick up a little known 7th round pick and stash him on IR last year – Chris Carson – who emerged as my RB2 down the stretch. Really proud of this team and I owe it to this site that gave me to tools to assemble it. Hey V … thanks so much for your comment. As I’ve said numerous times already … nothing better than you can say to us here at DLF HQ. That is an AWESOME testimonial, not only to DLF but especially you as a coach. Congratulations! Thank you for calling DLF home V! Jeff – I wanted to stop in to wish you a Happy New Year and to say thank you for all the advice this year. You helped me to win my dynasty league championship (2 out of the last 3 years) and finish 2nd in a new redraft league. I look forward to the offseason and using the site to determine offseason trades and keeper advice. Thanks again to the DLF Family. Thanks so much Joe, music to my ears. Thank YOU for supporting DLF and being part of our community. Wishing you a year of happiness, health and prosperity for you and your family!